Just a quick note to highlight two clients who’ve recently had success on Kickstarter and Indiegogo. Crowdfunding sites like these are a great way of gauging consumer interest and also taking pre-orders, which I believe is the best type of financing for your new product since you don’t have to pay it back like a loan, or give away a portion of your company as in equity financing. Check these out… there’s still time to participate in both of these fully-funded campaigns if you’re interested! The Ab Blaster is the 1st workout device to completely target your core muscles, challenging the most advanced athlete’s core workout. A no-gimmicks complete core workout device. The Ab Blaster is the first workout device to challenge your abs completely and conveniently in your home gym, or studio apartment with angular placement. With angular placement in 15-degree increments, the Ab Blaster takes the guesswork out of building a core workout into your exercise routine. The device enables you to target your abs 180 degrees from one oblique to the other and with proper form. 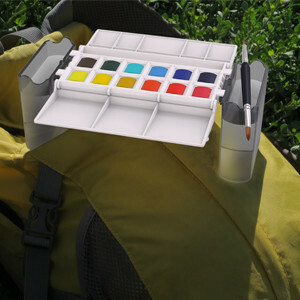 A compact, hands-free watercolor palette that’s perfect for travel. The Portable Painter™ comes from my [Steve Padden’s] art college roots. Since student days I’ve always carried a small watercolor set and other art supplies with me whenever I traveled. I realized that I could probably design a better watercolor set if I put my mind to it! This began a yearlong effort to identify all the elements I wanted and to combine them in a single, elegant set. In the design process I discovered a novel way to have the water containers connect securely with the case and form a pedestal base. This even allows the set to balance on a painter’s knee for totally hands-free use: So it has the potential of making open-air painting and urban sketching much simpler. Be sure to let me know if you launch a crowd-funding campaign for your new invention… I’m always happy to share the campaign with my other clients to help! This entry was posted in Crowd Funding, Invention Marketing, Raising Money by Kevin Prince. Bookmark the permalink.